Recipient of the 2011 Leonard Bernstein Award and winner of the 2010 Avery Fisher Career Grant, David has emerged as one of the world's most promising young artists. Since making his debut in 2005 with The Philadelphia Orchestra and conductor Christoph Eschenbach, David has performed with leading musicians and orchestras in the United States and Europe which include the Philharmonia Orchestra, Dresden Staatskapelle, Helsinki Philharmonic Orchestra, NDR Sinfonieorchester, and the Lucerne Symphony Orchestra. His first recording, released in 2009 (featuring his own viola arrangement of the Elgar Cello Concerto, after Lionel Tertis, and the Schnittke Viola Concerto under Christoph Eschenbach) was an international success, winning the coveted ‘Editor's Choice' accolade from Gramophone. His next disc featured Berlioz's Harold in Italy and Paganini's Sonata per la Grand Viola with Vladimir Ashkenazy and the Helsinki Philharmonic. That was followed by world premiere recordings of the recently rediscovered viola concertos of Joseph Martin Kraus. As a chamber musician, David has collaborated with such renowned artists as Emanuel Ax, Sarah Chang, Leonidas Kavakos, Gidon Kremer, Yo-Yo Ma, Julian Rachlin, Dmitry Sitkovetsky, Jean-Yves Thibaudet, and Yuja Wang. He is a regular guest artist at the Schleswig-Holstein and Verbier Music Festivals. David was born in New York in 1986 into a family of musical siblings. He began his studies on the violin at age six and later on the viola at the age of 11 and pursued both instruments at the pre-college divisions of the Juilliard and Manhattan Schools of Music in New York. David continued his studies with distinguished viola pedagogues Yuri Bashmet, Roberto Díaz, Nobuko Imai, and Pinchas Zukerman. In 2004, David was presented with the Presidential Gold Medal at a performance in Washington's Kennedy Center subsequent to his winning the first ever Gold Award from the National Foundation for the Advancement of the Arts (NFAA). 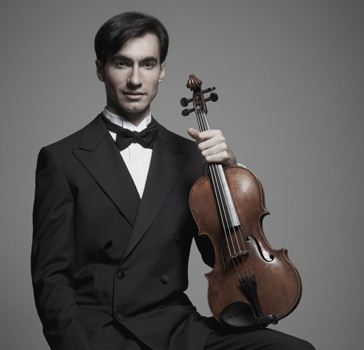 In 2005, David was the First Prize winner of the Greenfield Young Artists Competition, and in 2006 he won the highly coveted First Prize at the Walter E. Naumburg Viola Competition. In June 2007, David became the first American protégé for the Rolex Mentor and Protégé Arts Initiative with mentor Pinchas Zukerman. David plays on a viola made by Michele Deconet, Venice (1766) known as the 'Ex-Hamma.' In addition to his musical accomplishments, David received his Bachelor of Arts degree in Political Science and International Relations from Princeton University in 2008. David Aaron Carpenter has been acclaimed by The New York Times as producing, "a seductively rich sound and demonstrating both a forceful interpretive personality and remarkable control of his instrument," and by The Strad magazine as a violist, "whose beautiful modulated tone makes a striking impression." On working with David Aaron Carpenter, Christoph Eschenbach said, "It has been many years since I heard such a phenomenal talent as David Aaron Carpenter. He combines an endless imagination with a staggering technique, and making music together with him is a true joy." David is currently the Artistic Director of the New York-based Salomé Chamber Orchestra, which he co-founded with his brother Sean and sister Lauren. Salome has been orchestra-in-residence at New York's Metropolitan Museum of Art and hosts the Salome Music Festival in the East Hamptons every summer.